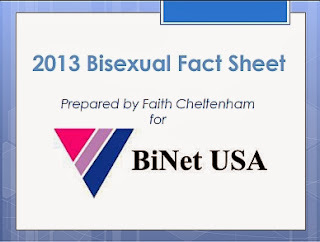 In the past eight years, BiNet USA and other bisexual advocates have fought hard for increased visibility in national politics and social justice movements. On several occasions, bi+ community leaders have been invited to President Obama’s White House to speak with administration officials and make our concerns known. 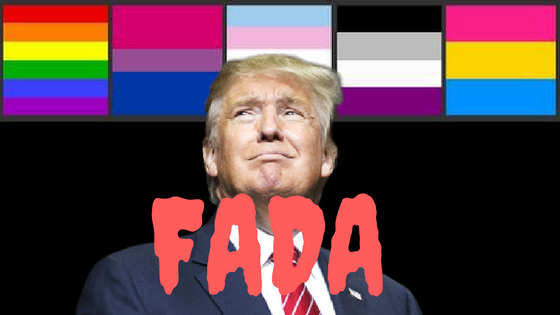 As the most LGBTQ-friendly presidential administration in American history comes to an end, and an openly hostile administration takes over, our fight for equality and justice may look different, but it certainly won’t stop. As we collectively mourn the outcome of the recent presidential election, it has already become clear that the fight for social justice will require more support than ever in the next four years. Although the entire LGBTQ community faces challenges to our rights and our humanity, the bisexual community remains particularly vulnerable when it comes to issues like healthcare access, discrimination, and anti-LGBTQ violence. Bi+ advocacy organizations like BiNet USA are also struggling to plan our work ahead, knowing that the current major disparities in funding bi-specific work will only become more severe as resources become scarce. All of this is to say that we need your support more than ever. We are a volunteer-run organization, and while we will continue to donate our own time and resources, our programmatic work does cost money. Moreover, the bi+ community faces disproportionate levels of poverty compared to the gay and lesbian community, so we recognize how important it is to support each other and enlist help from our allies. BiNet USA depends on your donations to keep hope alive. Bay Area Bi+ People! 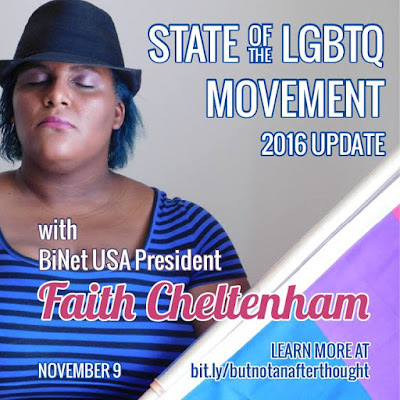 State of the LGBTQ Movement After Party with Faith Cheltenham! Come on out to the Cable 55 Bar at the Parc 55 Hotel to hang with Faith Cheltenham after the State of the LGBTQ Movement! Even if you had no time to RSVP for the 2016 State of the LGBTQ Movement Update on Wednesday Nov. 9th, drop by the Cable 55 bar and hang out with our Bi+ community for a conversation with the national Bi+ leader. After the incredible wins of 2015, what have been the defining moments for the LGBTQ movement in 2016? This annual event is your opportunity to hear from prominent leaders in our movement. They will discuss where we stand today, and the challenges and opportunities they see ahead for the LGBTQ movement. Learn more about the Horizon Foundation sponsored event here. Faith Cheltenham works to advocate for the bisexual, pansexual, fluid, and queer (bi+) community. Faith got her start in LGBTQIA advocacy as a Human Rights Campaign intern on the Gore 2000 campaign, and in 2002, she co-founded UCLA’s BlaQue for LGBT students of African descent. In 2013, Faith co-organized the first bisexual community issues roundtable at the White House and in 2014, she was honored to meet President Obama privately alongside other LGBT leaders before witnessing the President sign an Executive Order protecting LGBT employees of federal contractors from discrimination. Faith writes on bisexual community issues, people of color community concerns and other topics for South Florida Gay News, Huffington Post, BiNet USA and thefayth.net, her personal blog. Unwind over drinks at Cable 55 Bar, featuring sleek, urban décor, modern lighting and city views. Enjoy a choice of inventive cocktails, including our signature Manhattan, carefully selected wines and local micro-brewery beers and ales, served draft or by the bottle. RSVP for the Meet and Greet HERE!